Her parents took her on three month summer holidays to Scotland, but when the house they rented became unavailable, they rented Wray Castle near Ambleside in the Lake District. Beatrix was 16 when they first stayed here. Her parents entertained many eminent guests, including Hardwicke Rawnsley vicar of Low Wray Church, who in 1895 was to become one of the founders of the National Trust. 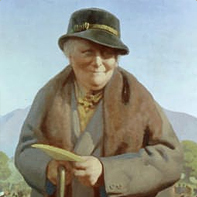 Beatrix Potter died on 22 December 1943.